Breathless (Soprano, Alto, and Tenor Saxophone). 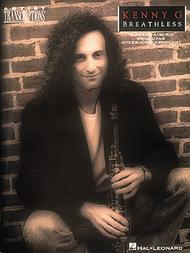 By Kenny G. For Saxophone. Hal Leonard Artist Transcriptions. Adult Contemporary and Pop. Difficulty: medium. Complete score songbook (includes separate pull-out saxophone part). Full score notation, chord names and drum notation. 72 pages. Published by Hal Leonard (HL.673229).ISBN 079352458X. With full score notation, chord names and drum notation. Adult Contemporary and Pop. 9x12 inches.Matching folio to his hit album with 14 pieces, including: Forever in Love * Sentimental * The Wedding Song * and more.About Hal Leonard Artist TranscriptionsArtist Transcriptions are authentic, note-for-note transcriptions of the hottest wind, electronic, guitar and keyboard artists. These outstanding, accurate arrangements are in an easy-to-read format which includes all essential lines. Artist Transcriptions can be used to perform, sequence or reference.